Treat yourself to a San Francisco tradition with the Sunday Champagne Brunch Buffet. Located on the lower level in the historic 1909 building, the Terrace Room offers amazing views of Seal Rocks, Ocean Beach, and the Pacific Ocean. Enjoy live harp music and free-flowing champagne as you choose from a wide selection of seasonal fresh brunch items. Poached salmon and prawns, steak with mushrooms, and pasta carbonara are just a few of the main course items you can choose from. Seasonal salads like heirloom tomato, green asparagus, and orzo pasta abound. Cheese and fruit platters, smoked salmon with bagels and assorted homemade pastries are a perfect complement to traditional breakfast items like scrambled eggs & bacon and of course the famous Cliff House popovers. Delectable desserts and chocolate-dipped strawberries are the perfect ending to your meal. 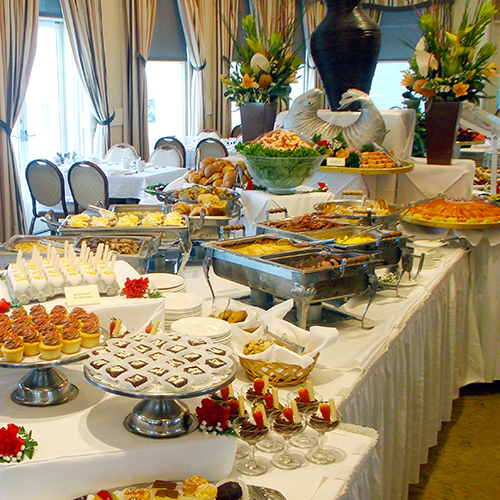 Sunday brunch in the Terrace Room is a quintessential San Francisco experience that should not be missed! Reservations: We do not accept online reservations for the Terrace Room Sunday Champagne buffet. You must phone (415) 386-3330; we recommend at least one week ahead for smaller parties and for parties of eight or more we recommend a minimum of three weeks advance reservations. Large groups of 17-49 are welcome to request a reservation for the Sunday Champagne Buffet. The seating times for large parties are 10:00 am and 1:00 pm. contact us at a minimum of three weeks in advance. Large party reservations require a contract and a $250 deposit. For reservations contact Lauraine Edir at (415) 666-4005 or lauraine@cliffhouse.com. For groups between 8 – 16 please call 415-386-3330.